"Little Richwood, not "Richwood Village"
The paper mill have been the largest employer to Plymouth North Carolin since the summer of 1937 when the construction begun on the mill. It was owned by Kieckhefer Container Company (John W. Kieckhefer) which was merged into Weyerhauser in 1957. In March of 2007 Weyerhaeuser Pulp and Paper Mill sold its paper interests to Domtar Paper Company LLC. The paper mill is now a Domtar papermill while the onsite sawmill is still owned by Weyerhauser. When they closed the Paper Mill in Richwood West Virginia in the early 1940's, several of the Richwooders mill workers migrated to Plymouth North Carolin and lived in a small village named little Richwood Village which is still there today, this photo was taken by Meredith Cook. 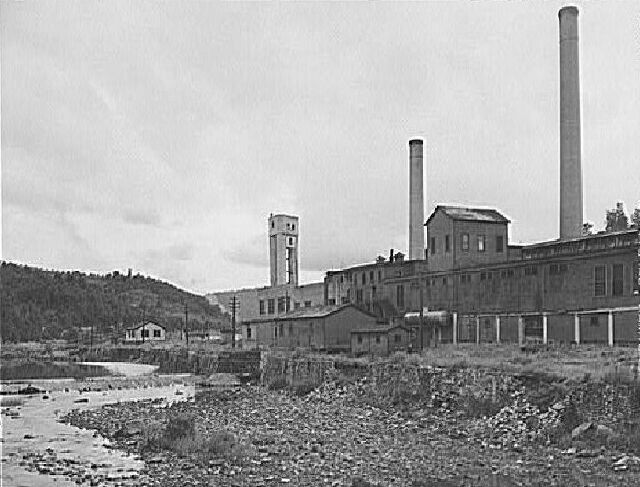 The spring of 1941 this Richwood West Virginia mill was producing paper but the shortage of raw materials and outdated machinery forced it to close About 1942. It has been brought to our attention by Jim Barker that there was a mistake on this web page and we sincerely apologize. The section of Plymouth, NC settled by Richwood natives is called "Little Richwood", not "Richwood Village". 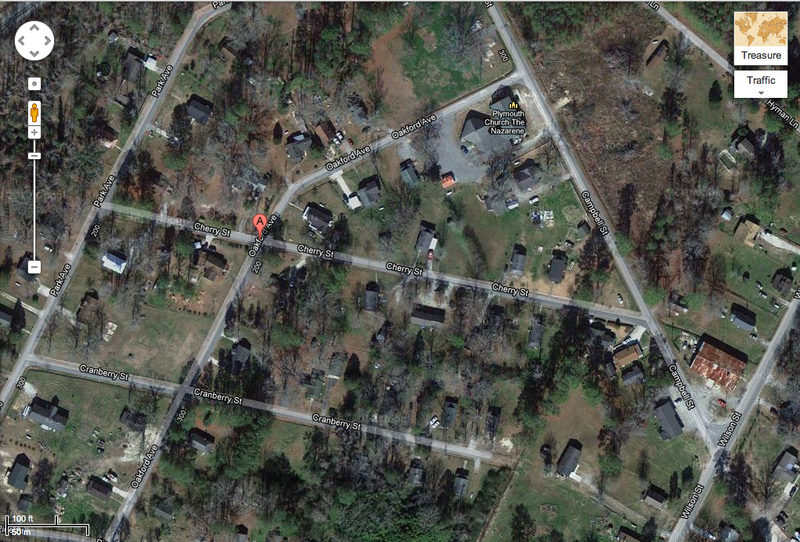 Jim pulled this from Google Earth on 04/01/2013. Notice the street names. This document provides additional background on the Mills operational period and details on why and when it moved. It's a lengthy document, but you can search for "Richwood" and it'll take you directly to the relevant parts. A little additional info on the Richwood Pulp Mill referenced on your site. I read the brief bio on your site and did a little digging myself. This email as well as two more I'm sending you provides a little more info. Does anyone know of a Cherry River Paper Company in Richwood? Peggy, AMEN!! My grandfather and my father worked there and when the mill shut down my family moved to Plymouth, NC with the remainder of the mill. I even worked part time at the mill in NC when in college. The village where many of the Richwood folks moved to was named "Little Richwood." I went to the Tannery School in the first and second grade and walked across the swinging bridge to get there. How can I help you? Very few of the original Richwood area workers are still alive in NC, but the area is full of their offspring. I just wanted to add this to what George Painter said. The Cherry River Pulp and Paper Company was started in 1904. The first production came in 1905 and it operated in Richwood, WV until 1940. Company houses were built for employees and the company also had it's own school, baseball team and a brass band for which they built a bandstand. 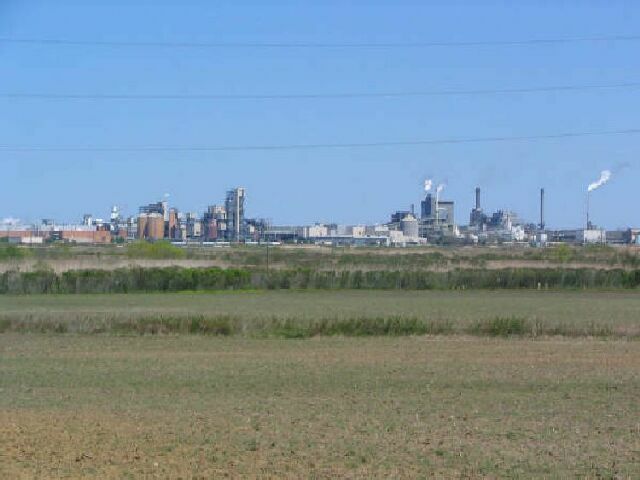 The mill was sold to Keickhefer Container Corporation and through mergers with North Carolina Pulp Company it was finally purchased by Weyerhaueuser Co and moved to Plymouth, NC and over 100 families left Richwood to work in the pulp mill there. George, among those that possibly moved to Plymouth were the sons of a man named Jackco Giordano who had all worked in the mill in Richwood. Jackco himself worked at the mill in Richwood as a night watchman. He was know then as John Jordan. The sons that I believe may have gone to NC were Lloyd, Guy, Robert, John and Tom. These men changed their last name from Giordano to Jordan also. Lloyd Jordan died in Plymouth, NC in 1949 and was brought back to Richwood for burial. His son Garfield Jordan now lives in NJ. Guy Jordan may have died in NC. I have been looking for his death date and place for some time. Would you have any knowledge of this Giordano/Jordan family? I am making no claims that the above information is correct. This is being given as personal information and not all has been documented. (2) The Cherry River Pulp and Paper Company Mill.